Teak is synonymous with luxury and timeless beauty, and it holds a well-earned place as the gold standard of wood furniture and flooring. Its rich coloring and lasting shine lend an air of refinement to any room. Despite its advantages, though, teak isn’t always the best choice of flooring. The high cost, in particular, makes this wood less appealing if you’re on a budget. What’s more, it takes some care to avoid the illegal teak trade. One of the greatest benefits of teak flooring is that it keeps its attractive appearance while being relatively unfussy in terms of care requirements. With its warm brown color and straight grain pattern, teak looks good in every room and is especially well suited to traditional decor styles. Even better, it retains this beauty for years even under heavy use. Teak is one of the hardest species of wood, and as such, it’s highly resistant to scratches, dings, and other forms of damage caused by daily foot traffic. It’s ideal for high-traffic areas, such as the living room or hallway, and also works well in homes with active kids and pets. 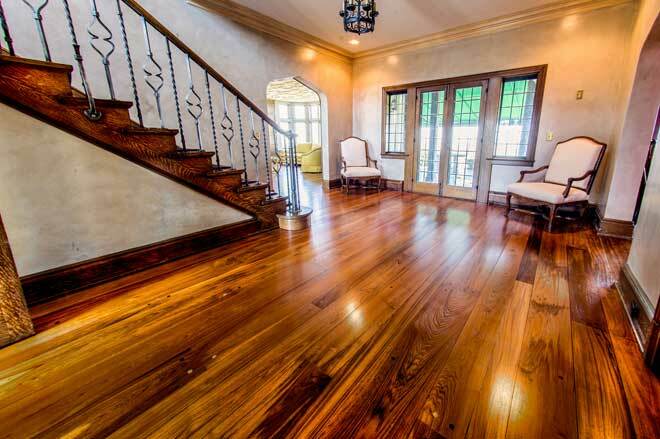 Because teak is naturally rich in oils, new teak floors come with a luminous shine even with no additional treatment. The wood retains these oils well, so some homeowners opt to skip the sealers and other treatments and let the wood age naturally. The oils help the wood resist drying and cracking, which means not only will the shine last for years, but also that the floor won’t produce splinters that need sanding. Ordinary sweeping and mopping are all you’ll need to do. If you prefer to keep the floor looking new, you’ll need to lightly oil it once a year and polish it every three or four years, depending on the amount of foot traffic in your home. Compared to the care some hardwoods require, however, this is minimal. Thanks to its hardness and high content of oil and resins, teak naturally absorbs little moisture. When properly treated with sealer, it’s highly unlikely to take in enough water or humidity to cause damage. Even without sealer, teak will simply weather to a silvery grey. This is one reason teak is so often used in high-end patio furniture and as decking on boats. In your home, teak is an excellent choice for bathroom or kitchen floors. While an overflowing bathtub might ruin many wood floors, teak will come through just fine. Teak’s hardness and natural oils also make it unappealing to many insects and fungi. You won’t have to worry about termites eating your floors or mold causing blotches and rot. For a number of reasons, teak isn’t necessarily the ideal choice if you’re looking for an eco-friendly flooring. Finding sustainably grown teak is possible, but it can take some effort. As another downside, the advantages teak offers don’t come cheaply. Teak is a tropical hardwood grown in a number of Southeast Asian countries, including Myanmar, Indonesia, and India. It’s a slow-growing tree with many varieties taking between 80 and 120 years to fully mature. This fact, combined with over-harvesting, means many species of teak are now endangered and illegal to export. The only species still legal to export is common teak (Tectona grandis). These trees come from specially planted tree farms, a more environmentally sustainable option. For economic reasons, the trees are typically harvested at 40 to 60 years of age, meaning the wood is often soft and available only in shorter lengths. Softer wood can’t offer the durability teak is renowned for. This has led to an illegal trade in endangered species of teak trees cut from forests. To make matters worse, shipping this particularly heavy wood from Southeast Asia to the major markets in North American and Europe increases the carbon footprint of teak flooring. Some teak is grown in the U.S., however. 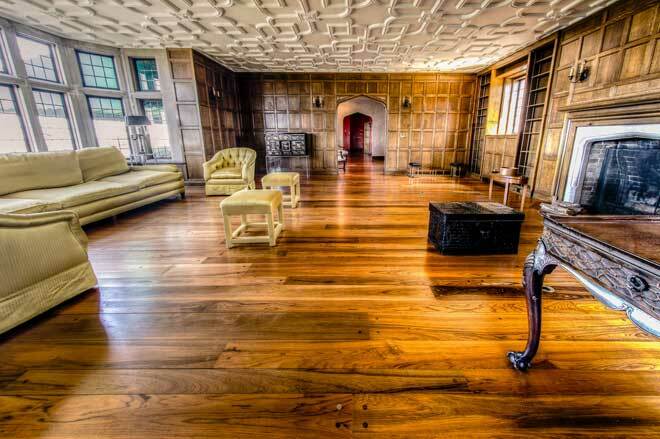 If you want to install teak flooring, consider reclaimed wood. This is wood recovered from old homes and other sources. Teak’s durability makes it ideal for re-use. If you buy new flooring, however, make sure it holds FSC (Forestry Stewardship Counsel) certification. While teak offers numerous benefits and can last for decades, those desirable qualities come at a price. Teak is a decidedly premium option. 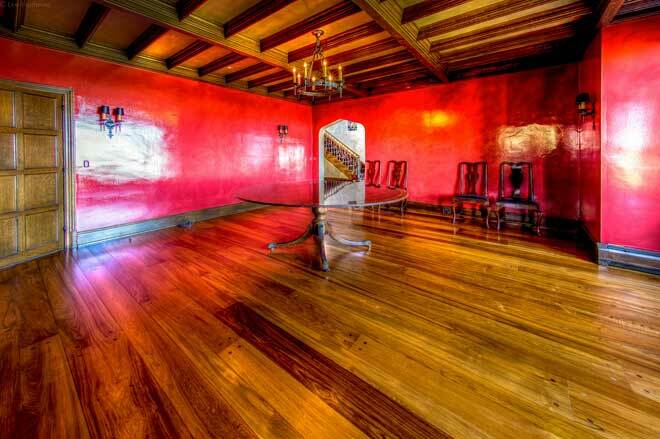 On average, this flooring will run you between $9 to $13 per sq. ft. Compare that to popular American hardwoods, which go for around $4 to $8 per sq. ft.
Teak’s weight and density make it relatively difficult to work with. It requires more effort to carry and lay into place and cutting this wood can take a toll on your flooring installers’ equipment. These factors can raise the cost of installation. With its rich coloring, durability, and ease of maintenance, teak flooring has a lot going for it. It’s a sensible investment if you’re building a home to be passed down through the generations or you simply want to enjoy an ambiance of luxury. On the other hand, if you’re not set on having high-end flooring or teak just isn’t in your budget, American hardwoods and more sustainable exotics such as eucalyptus make beautiful, less costly alternatives.